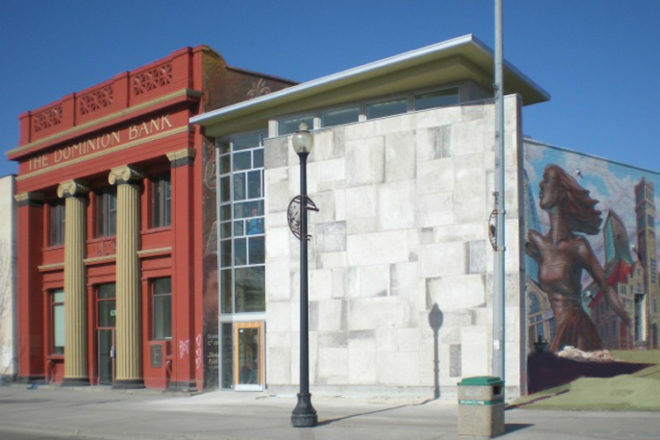 The Old Dominion Bank (1907) represents one of the few remaining grand Beaux-Arts Classical style buildings at the corner of Higgins and Main. Restored as an architectural office by BridgmanCollaborative Architecture the building includes an ornate banking hall with its fine plasterwork and columns, vaults, bankers offices, a terra cotta façade and an addition made from the convention Centre original stone cladding. In the garden are stones from the old Winnipeg City Hall. Included in the tour is a discussion of the history of the historic context of built forms in and around Higgins and Main. Guided tours will run throughout the day, lasting 20 minutes.